Mechanical keyboards are fast becoming the “it” peripheral device right now, and there are many companies coming out with their own models. Cooler Master has done a really great job with their line, focusing on well built classic designs. 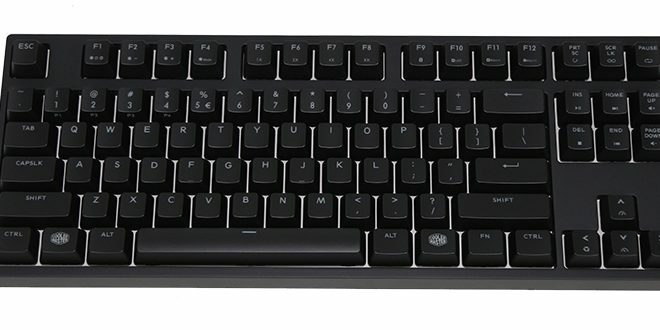 They have gone outside the norm style wise on a few keyboards and switch-wise when they came out with the much loved Novatouch TKL that has MX compatible stems. The Cooler Master MasterKeys Pro S White aims to provide a minimalistic design packing crisp white backlighting, on-the-fly macros, and profile support. 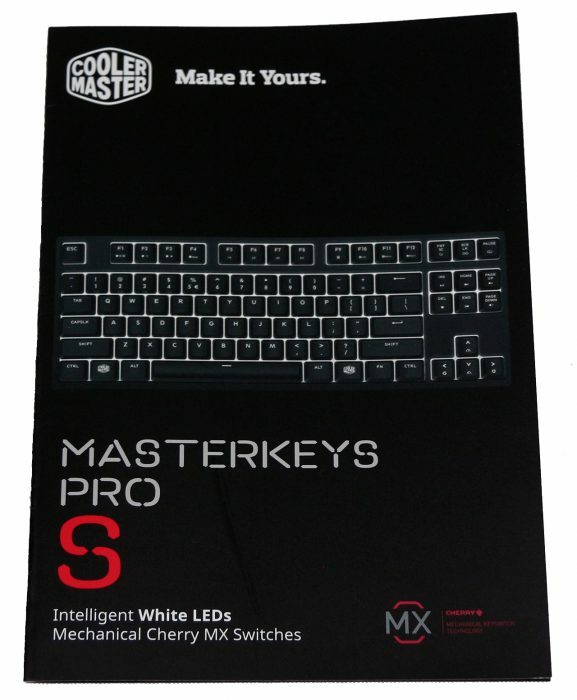 We will take a look at the brand new MasterKeys Pro S White version and see what we think of it. Bright white LED backlighting – The white LEDs provide a brighter and truer white than is achievable with RGB LEDs. The steel backplate under the keys helps the white LEDs shine extra bright. Multiple lighting modes – You can customize the keyboard with multiple lighting modes without the need of any extra software. Breathing, wave, and responsive effects are some of the lighting presets that are included. Cherry MX Blue Switches – guaranteed for 50million keystrokes the MX Blues provide a tactile feel with a satisfying click. Minimalist design – A heavy quality feeling 80% TKL (tenkeyless) layout. The packaging is fairly standard and of good quality. The picture on the box is a quality representation of how bright the white backlighting is. You will notice that the box proudly displays that the switches are true Cherry MX Blue switches. 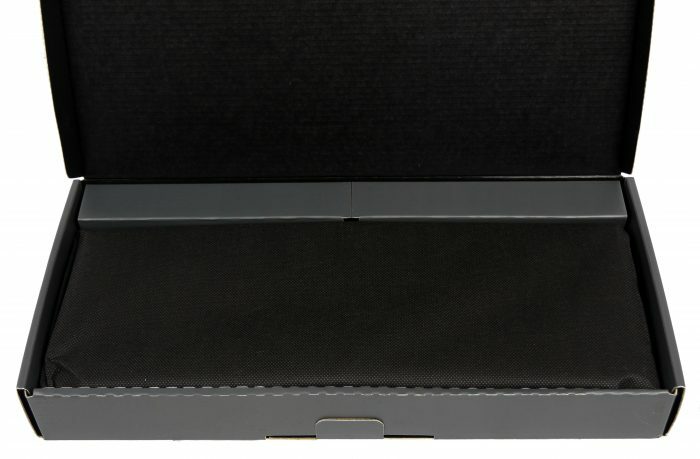 Inside the keyboard is secured inside a synthetic cloth sleeve. Along with the keyboard the USB cable, key puller, and pamphlet. The reflectiveness of the steel plate under the keys is on full display in this picture. While plugged in, the shiny plate really helps punch up the brightness of the white LEDs that it has. The bottom of the keyboard is pretty standard with nice large rubber feet to keep it placed where you want it to be and not move around a lot. There are also a pair feet that flip out for getting the keyboard at an angle if that is how you prefer to use it. The removable cable is really a great addition to any keyboard not only because it makes storage and transport a bit nicer, but also for customization. if you have a setup that you are trying to coordinate you could get a different micro-USB cable to fit in with that scheme. 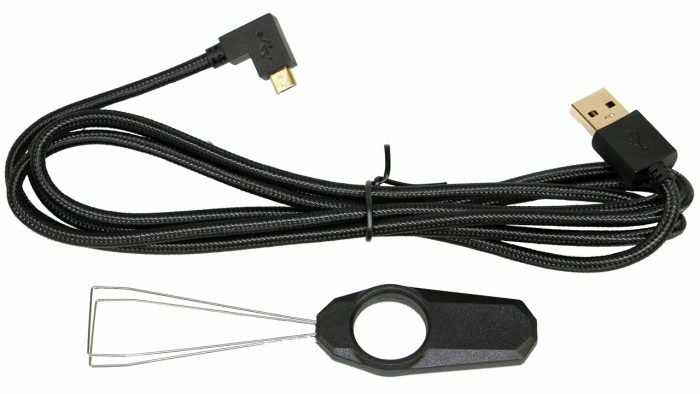 A new emerging niche market is actually custom sleeved cables for keyboards, and there sure are some great offerings. The included micro-USB cable is of very nice quality and I think users will be very pleased that the connector is a right-angle connector. In addition to the cable Cooler Master also provides a wire key puller, and these are much better than the plastic pullers that some companies give you. The pamphlet is a simple folded piece that sure will come in handy as you will want to use it often as a cheat sheet for setting up macros, lighting, and profiles. The Cherry MX Blue switches are really a pleasure only for the user as the loud clicking sounds will likely wear at the nerves of others within earshot. With that said it is probably the most satisfying switch type to use as with the tactile feel you get the reassuring click at the actuation point. In usage, it most definitely makes me a better typing over a linear switch or even a non-clicky tactile switch like the Cherry MX Brown. I used the keyboard to play World of Warcraft and some Battlefield 4 during my testing and the experience was great. The movements are responsive to the inputs as one would expect from a keyboard with a 1000Hz polling rate. In both games there is a fair amount of typing that I usually do to communicate and I could tell that I spent a lot less time backspacing and correcting what I typed. When I used a linear switch type that I can’t tell exactly the actuation, I do tend to notice that there are a lot of typos. Next, I tested out setting up macros and lighting on the MasterKeys Pro S. Setting up profiles and lighting schemes for each one went very fast and easy. I did struggle for a while to get the macro setup down, as it seems to like single keys as ones set up for macros. I couldn’t find a way to add a modifier to start the macro (such as Alt+Ctrl+M for a macro) so I found that the macros worked better when mapped to buttons you will never use in your game of choice. Overall, the MasterKeys Pro S White is a definite ideal choice for someone who is wanting a mechanical keyboard; a classic design, bright white LED backlight, and Cherry MX keys. I really enjoyed my time testing out the keyboard and think that it really would be a solid choice for anyone who is wanting a TKL keyboard with white LED lighting. The feel of the keyboard is solid, and it feels and looks as though it is very well built. If you are wanting some color in your setup Cooler Master also offers an RGB version of the MasterKeys Pro S.
I do think that using a detachable cable on this keyboard is a great idea. 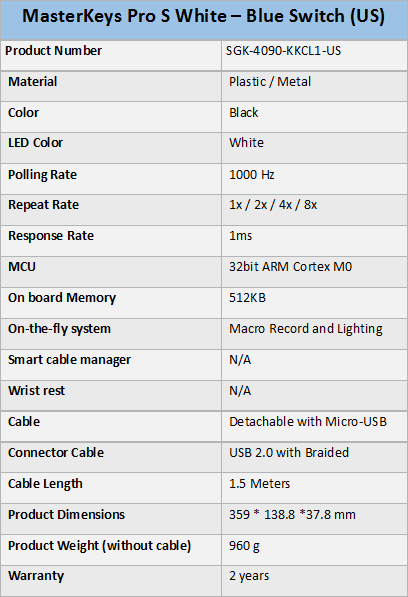 I do think that by using possibly a micro-USB connection it might be a little less sturdy than the more common mini-USB connection. By being careful this shouldn’t be a worry for the user thankfully. If you plan to use this around others that may not be okay with constant clicking I would highly recommend the version with Cherry MX Browns if you want to stay on good terms with them. Priced at $99.99, the Cooler Master MasterKeys Pro S White is a solid buy backed up with a 2-year warranty on the keyboard. The inclusion of anti-ghosting, n-key rollover, multimedia keys, multiple lighting effects, multiple profiles, and the ability to make on the fly macros all without any needed extra software makes this one feature packed keyboard, and earning it the Bjorn3D Silver Bear Award. The Cooler Master Masterkeys Pro S White is a feature packed mechanical keyboard in a classic TKL design sporting brilliant white LEDS.